Widely thought of as Scotland's Nelson, Admiral Sir Andrew Wood was unquestionably the first of a pantheon of naval heroes who would ensure that Britannia ruled the waves for nearly three hundred years. As Admiral to the Scottish monarchs James III and James IV, it was his infectious courage, his inherent powers of leadership and diplomacy, and those scores of embarrassing successes against marauding privateers and the best fleets England could throw at him that finally induced the Tudor kings Henry VII and VIII to launch a standing navy that would, in time, establish Great Britain as a world power. 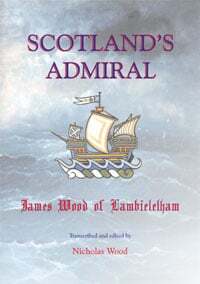 This book will surely prove to be an enormous boon to all students of the tempestuous years of Renaissance Scotland between about 1450 and 1520, while it is specifically a biographical account of the exciting life and adventures of Sir Andrew Wood (circa 1455-1515), the seagoing merchant of Leith by Edinburgh who prospered as he fought off buccaneers and the fleets of foreign governments till his reputation for mastery of the seas brought him the feudal barony of Largo in Fife and the rank of Admiral of Scotland. He served kings James III, IV and V, whose turbulent and uncertain times are the setting of this true tale of conspicuous valour, bloody political intrigue and familial love. All this amounts to a thoroughly fascinating and thrilling tale that you can read on your PC, laptop, tablet or smartphone. If you prefer a paper version, you can always print it out. This ebook can be purchased for £3.95. Simply click on The Clan Shop in the Menu.